If you’ve got family, then eventually, you get their “stuff”. Whether it’s a box of miscellaneous jewelry, or ancient garden tools, something has to be done with it (Scott got tools from his grandparents – and since we were newly married and homeowners, it was a wonderful gift!). Every week we have at least one appointment at Scott’s Custom Jewelers in either our Akron, Ohio or Columbus OH jewelry store that starts with a box of dazzling treasures. The meeting generally goes like this. There’s not a whole lot of jewelry jokes you can make, so we roll with it. Cindy was one of those people. Her childless aunt and uncle had passed away, leaving her with a lifetime of jewelry to sort through. Some of the gold pieces we simply polished and repaired, breathing new life into them. The others we categorized into gold, costume and non repairable jewelry. There was A LOT to go through! Fortunately for Cindy, her aunt had great taste in jewelry. She collected many unique designs from her travels, and they were perfect just the way they were. Other pieces, like her aunt’s diamond engagement ring, posed a little bit of a problem for her. She wanted to wear it, but not replace her own diamond wedding ring. And she tended to only wear one ring per hand. So, we came up with an idea for a custom diamond pendant. Since Cindy liked to mix up her metals a bit, we designed this funky, chunky 14k two tone number to accent the diamond, using our special CAD (computer aided design) technology. We used a combination of gold roping and a bezel to enhance the gemstone, and made the bail (the part where the chain goes through) large enough to accommodate her collection of chains and a sleek black cord for a more casual look. As for the many broken gold chains, lone earrings and out of style ring mountings, Cindy was able to trade that gold in for credit towards her new custom jewelry. Not only does that keep her final price low, but it’s “green” too. 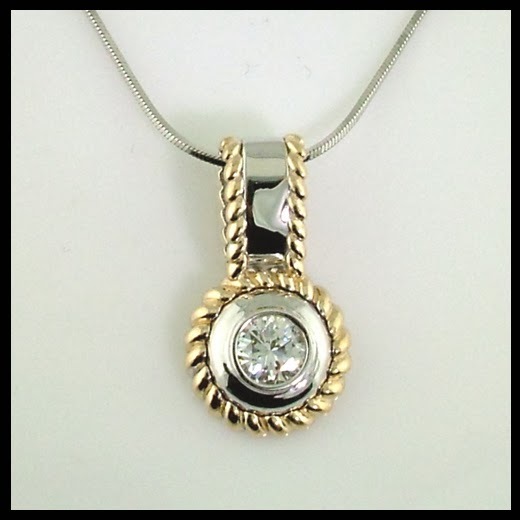 The finished diamond pendant fits her lifestyle perfectly, and is a beautiful reminder of some lovely relatives, and the gifts they left behind.